This is an AWESOME idea from Vicky of The City Cradle. GENIUS! 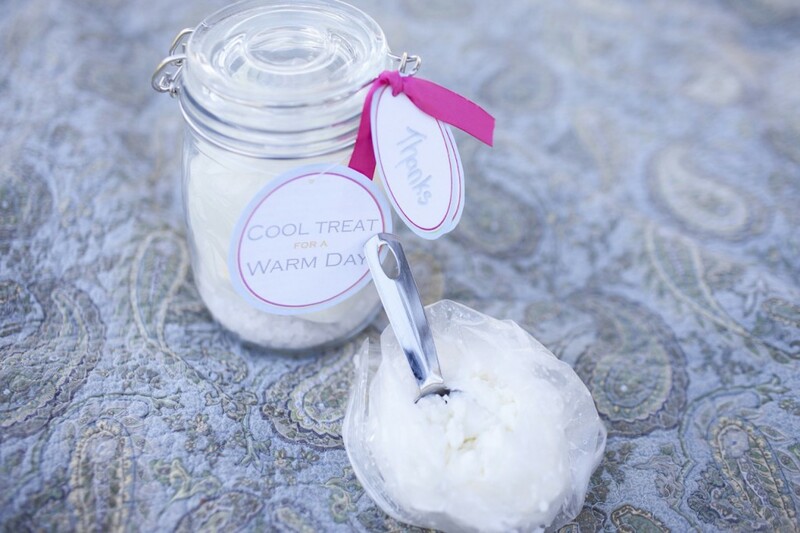 These DIY Ice Cream Favors are perfect for a child’s birthday party … or I’m thinking maybe even my hot August wedding! 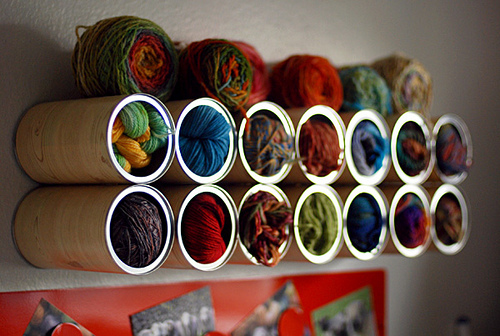 Great Storage Idea from Leethal Blog! I saw these in my RSS feed last week from Do Stuff! Leethal Blog by Lee Meredith and then again in a post by Re-Nest and so I just had to share this great idea with Furious Shirley readers! Drawing inspiration from a Pringles can project on ReadyMade, Lee used coffee cans, contact paper, cardboard, duct tape, and contact cement to create these awesome storage cubbies. Here pictured housing yarn, I can imagine these stuffed with all kinds of things! 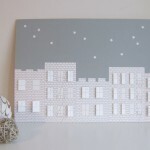 For more details on making a set of your own, visit Lee’s Leethal Blog! Birds are chirping, specks of green are pushing up through the soil, my winter clothes have all been neatly folded and stored away, receipts are piled up on the desk, thoughts deductions and dependents fill my head … yes, it’s TAX TIME! Even if you’re expecting to get money back, tax time is not something most people look forward to. It’s just one more thing we have to squeeze into our already busy schedules. I was recently contacted about doing a giveaway on my blog for H&R Block’s At Home Deluxe software package and I thought it would be a perfect fit for all of my DIY readers. With this software package [a $49 value], you can efile for free, get step by step instructions, automatic error check, audit and investment support, and the ability to import your data from the previous tax year and maximize your deductions. Basically, it makes doing your own taxes a lot easier and saves you from having to pay the $300 I had to shell out to visit a tax professional last year. Learn how to win this package HERE! 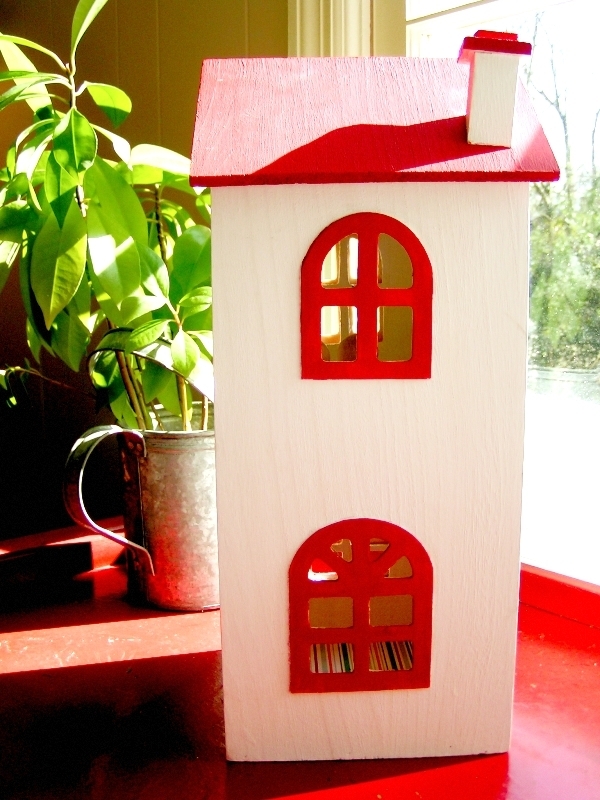 Now all you need are some must-have supplies to get your tax info in order and adorn your desk with some style! 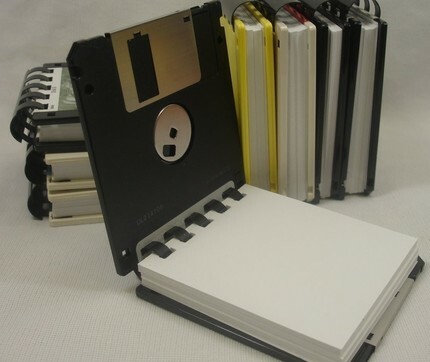 This super cute notepad from It’s Our Earth Inc. is made from recycled floppy disks and acid free recycled paper. Perfect for jotting down tax notes, grocery lists, or dreaded to-dos! 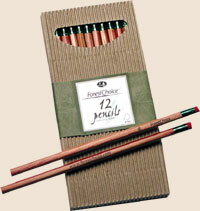 Get out your #2 pencils … these graphite pencils are from ForestChoice and are made using Incense-Cedar wood from an environmentally well-managed forest in California. How fun are these drumstick pencils from ThinkGeek?! 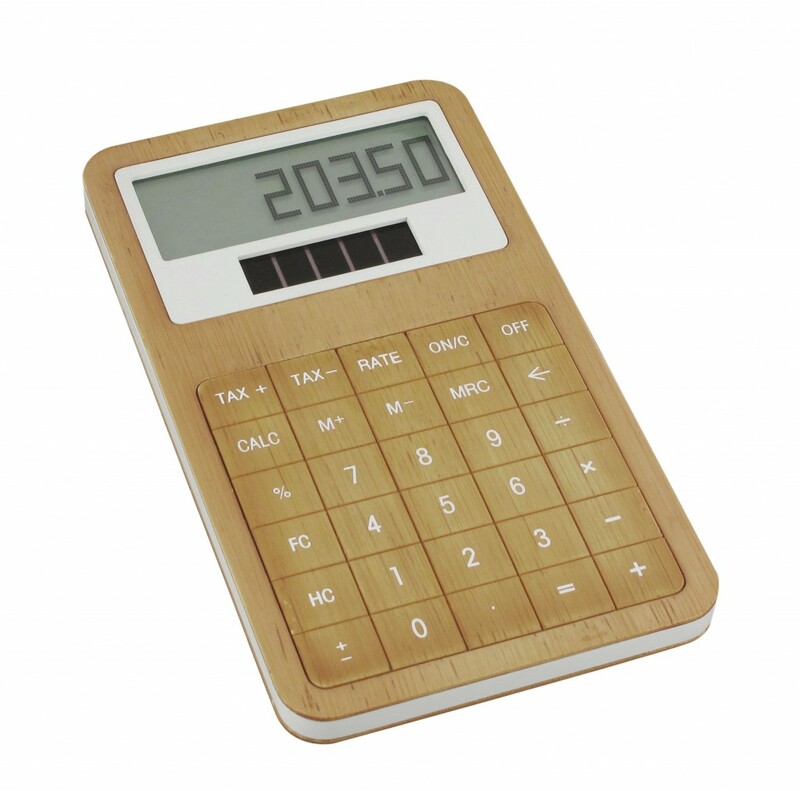 A calculator is a tax time must have. These models from the Japanese company, Caina.jp mimic a computer keypad [via geek alerts]. Great design! 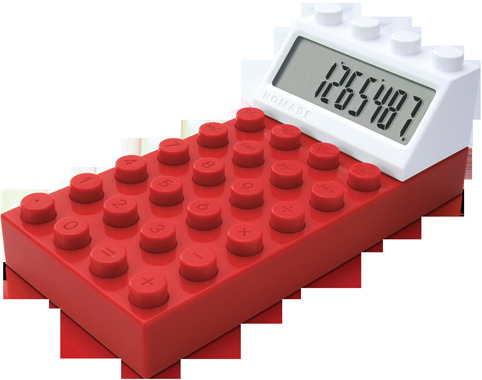 Or for you Lego lovers, there is this building block calculator available from Pylones in red, black, blue, and green. And my favorite is from Lexon – part of their bamboo line and last time I checked, sold out. I’m hoping it will be back in stock soooooon! 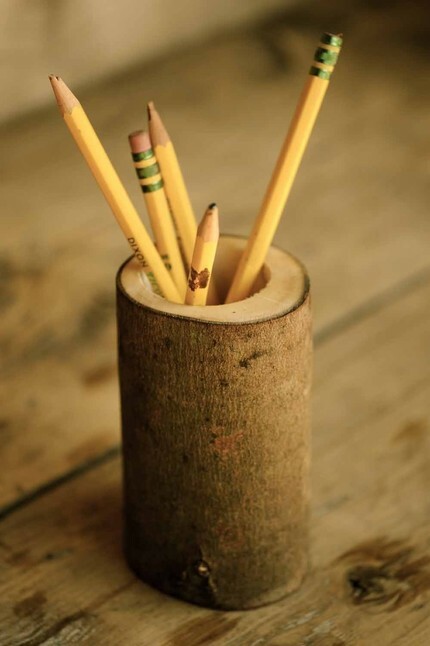 Bring a little piece of nature to your work space with this pencil holder from Made in the Hudson Valley made out of a branch from a fallen maple tree. 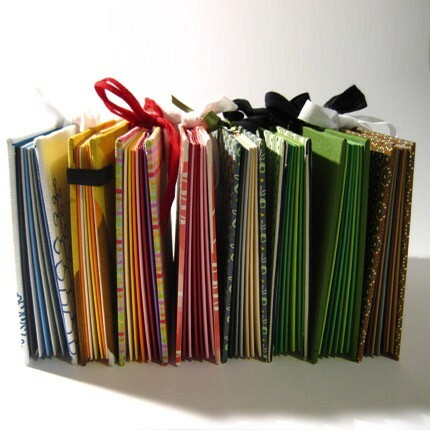 You’re going to need a place to keep all of those receipts, so try this DIY Memo Pockets Kit from Paperama. I would love to make these if I had the time [or the crafting skills]. 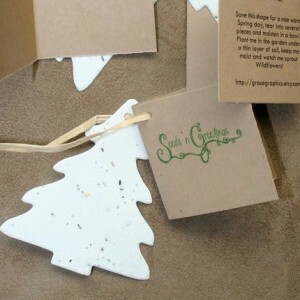 This craft is so simple that even someone with no crafting skills [like me] can do it! It’s also perfect for little ones who can wield scissors. As you can tell from the photo, my scissor skills aren’t the greatest, [I can’t cut a straight line to save my life] but Ava doesn’t care. She loves taking the pieces off and rearranging them. I also use it to tell her stories. Originally, I glued the widows and door onto the house, but she just pulled them off [she’s 14 months] so I recommend just keeping all the pieces separate for those too young to understand the concept of “please don’t break that”. This felt creation by Melissa Crowe is actually a piece commissioned by the Wintergreen Arts Center in Maine, but it’s a great idea you can make for your own home [little ones old enough to use scissors can help!]. 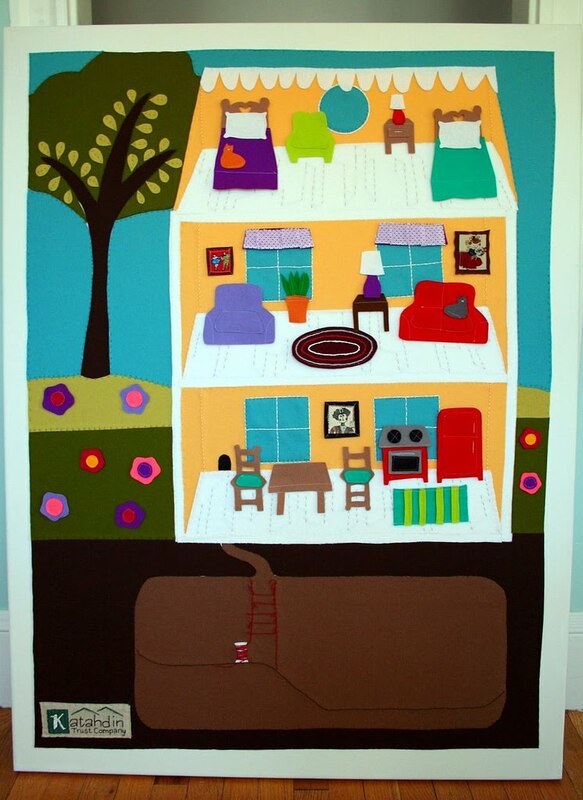 The house is mounted on canvas and decorated in felt and moleskin that can be moved around [just like a felt board]. 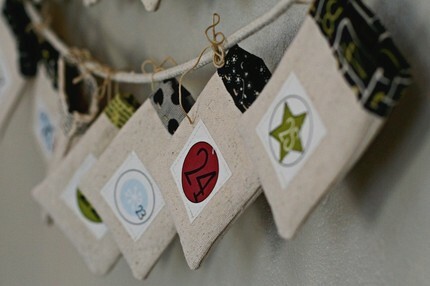 For more photos [and more great crafts], check out Melissa’s blog, Checkout Girl. …and Bright and Blithe to check out this version! 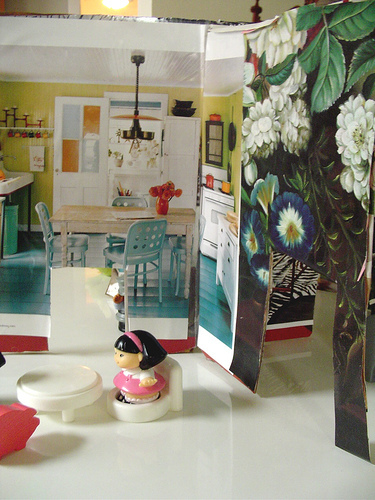 I also found several versions of these cute cardboard and foam core board dollhouses. The customization possibilities are endless and it’s super mobile and would be a fun project to put together with your little one. 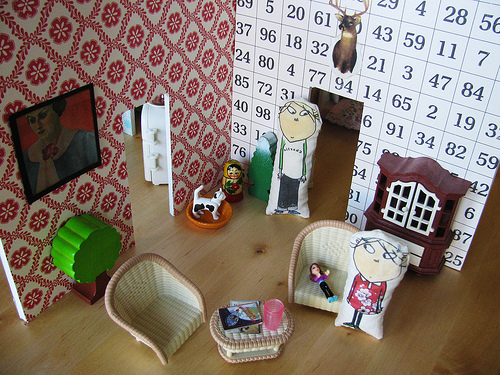 The tutorial for the picture below is available at Cookie Magazine. 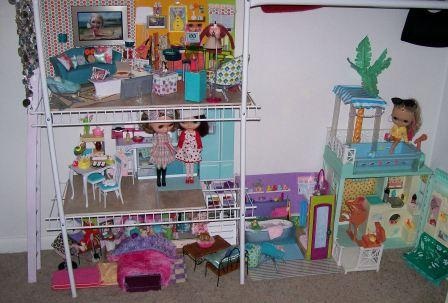 That tutorial was the motivation for this super duper dollhouse put together by the obviously crafty Amy of Sweet Sweet Life. 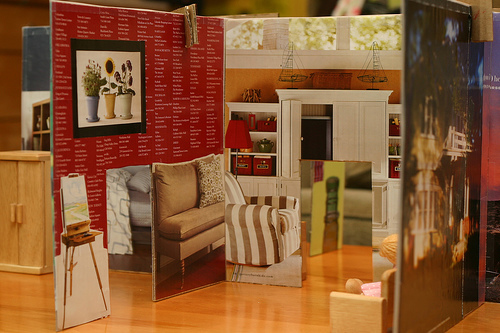 Taking inspiration from the Constantine Dollhouse from Kidsmodern, this creation was born out of a cardboard box, lots of tape, and some magazines. Read the full tutorial from Elsie Marley. 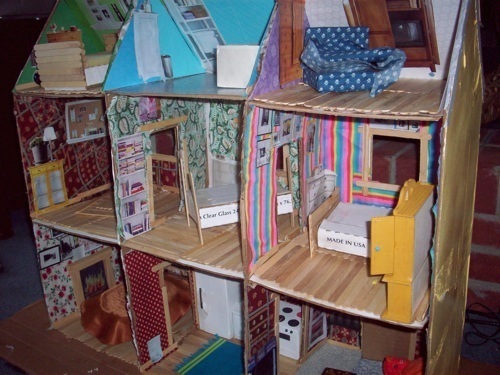 This tutorial for a recycled materials dollhouse can be found at Craftastica, where Kristy and her daughter Eva fashioned this house based on the above idea. 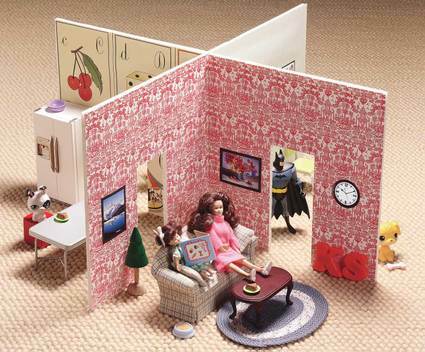 I found this multi-level cardboard dollhouse in a feature on Ohdeedoh. It was made by Adrienne and decorated with scrap fabric, wallpaper samples, popsicle sticks, etc. 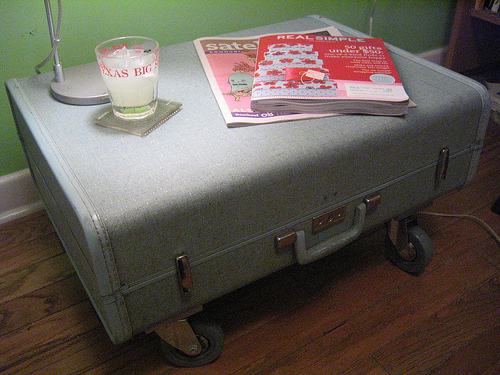 I love the look of old luggage – it has so much character, so many stories to tell. But what do you do with it? 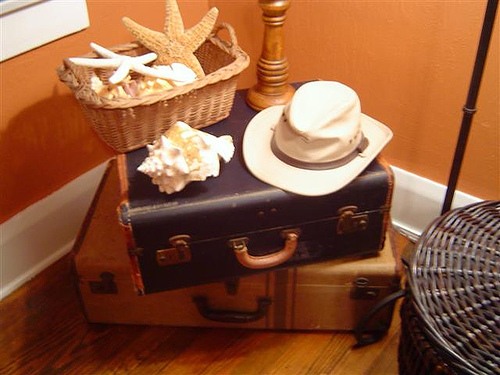 Many vintage suitcases are too heavy or too musty to use for packing clothes. 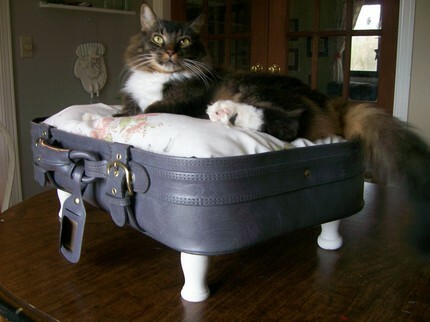 So why not turn it into a pet bed?! This idea falls into the category of “I could totally make that …. but I won’t”. There are several different styles of these vintage suitcase pet beds at Love-Nostalgic-Whimsy on Etsy! 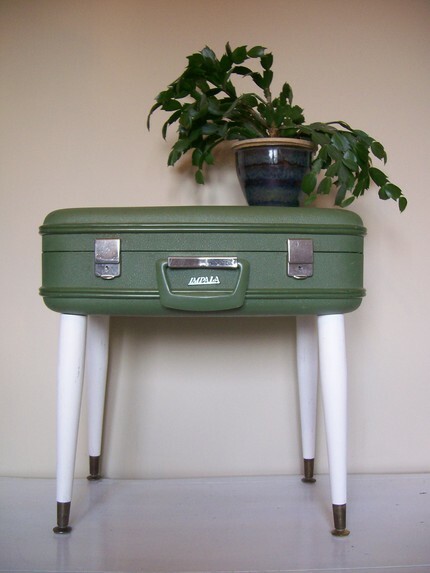 The Love-Nostalgic-Whimsy store has several other upcycled vintage suitcase items for sale, including this retro looking side table. 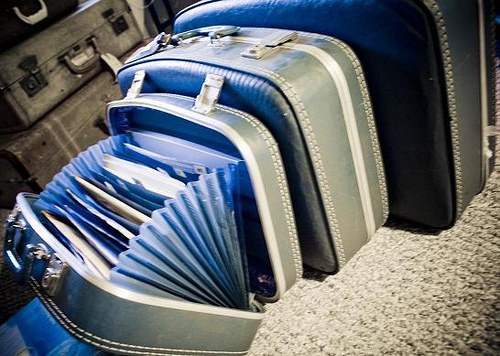 A vintage suitcase filing cabinet?! Love it! Courtesy of Poetic Home. Another side table idea – this time on casters! 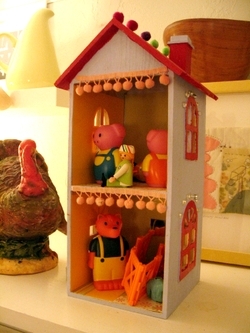 So easy and so cute [doubles as storage too]. Via sassycrafter on Flikr! Oh and be sure to check out Kim’s blog – The Sassy Crafter – she’s going to be posting a DIY tutorial for this lovely piece! 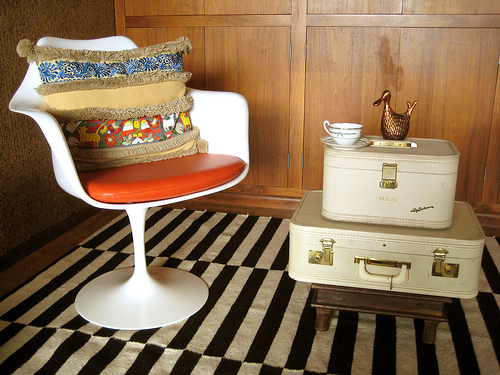 Just stacking a few vintage suitcases can make a great side table too! My bowl wasn’t really deep enough and using the mixer turned into a giant mess so I had to reach in and finish it off with my hands. So much for keeping things neat and simple. It tasted pretty good so I must have done something right. I put the dough in the fridge to chill, cleaned up the counters, and had a glass of wine. Ahhhhhhhh. Two hours later it was time to get the cookies rolled and cut and into the oven. I enlisted Mike’s help for this. We realized we do not own a rolling pin so we had to use cans of diced tomatoes to roll out the dough. We got the first batch in and out of the oven, but then we were either working too fast or impatiently because our gingerbread men starting losing heads. Let’s just say the majority of our cookies looked more like blobs than snowflakes, candy canes, and gingermen. Finally it was time to frost! I must have used too much milk because it was pretty thin, but I was out of powdered sugar so we had to work with it. But in the end we just gave up, piled all the cookie pieces onto a plate and drizzled icing over them. 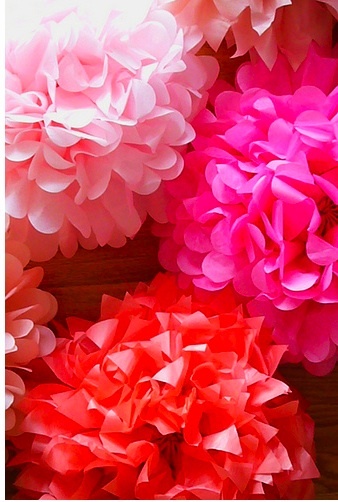 I kept seeing these pretty tissue paper pom poms in all of my crafty RSS feeds and thought, “Those look simple enough even for me to make. How hard could it be?”. Eventually, I got one pretty nice pom pom and one smaller flower looking pom – not exactly a garland. Where do the crafty people find the time? They must not have small children or maybe they stay up all night like little elves thinking of cute stuff to make that will make someone like me feel inferior. But if I can’t make it, someone can and then people like me can just buy it. If any of you are interested in doing a guest blog craft tutorial, let me know! DIY Bows, Plantable Gift Tags, & Holiday Cards! Check out this tutorial on making your own bows from magazine pages from Talk Crafty To Me [they also have tons of fun holidays crafts!]. I think they look even prettier than store bought bows and the customization possibilities are endless! I am going to be making some of my own bow creations this week and will definitely share the results with you. How about you? 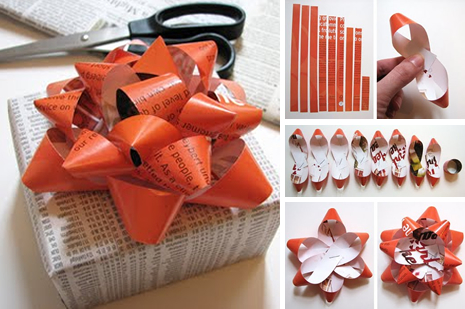 Will you be making your own bows? What are you using to make them and CAN I SEE THEM?? 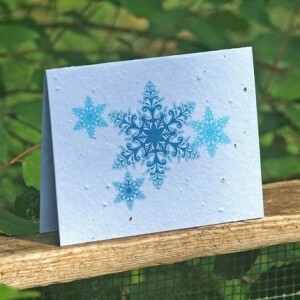 I am really digging [no pun intended] all the plantable cards and gift tags hitting the marketplace. Grace Graphics in Eastern Oklahoma turns out these plantable creations using recycled fibers and soy & vegetable based inks. She has quite a selection of Christmas and Hanukka cards available and I just love the “Seeds n’ Greetings” phrase printed on the gift tags! 1 dozen gift tags for $11.50 and cards are $3.75 each. 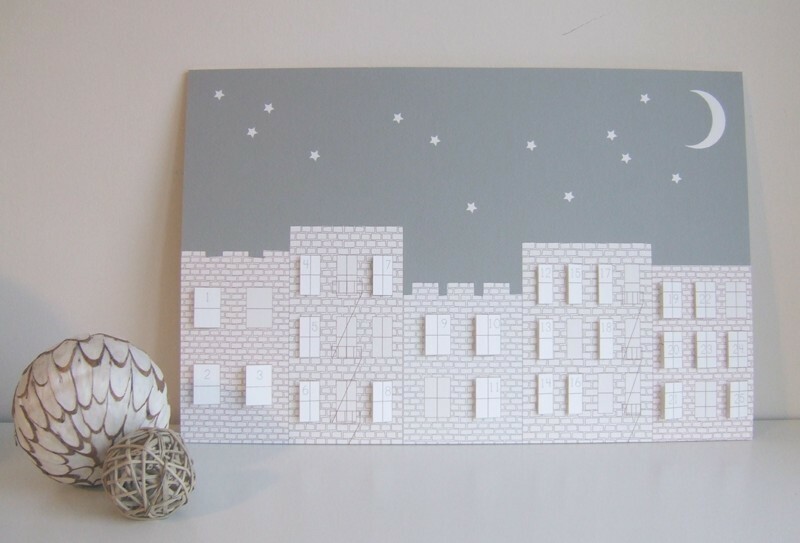 I came across a lovely little blog today called ormolu, belonging to Kaitlin Sheaffer who is a mom who loves paper, handmade, and interior design. 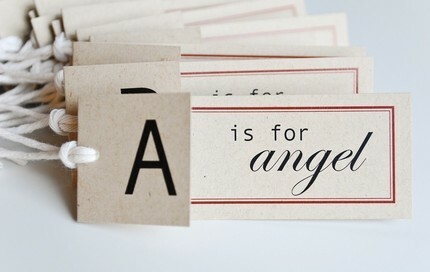 She has an Etsy shop filled with all sorts of wonderful things like these A is for Angel Alphabet Gift Tags – 26 for $8.00 …. and these Love Song Paper Chains [that I completely ADORE], which would make an excellent garland [there are also some Christmas themed chains available] – approx. 1 yard for $4.50. 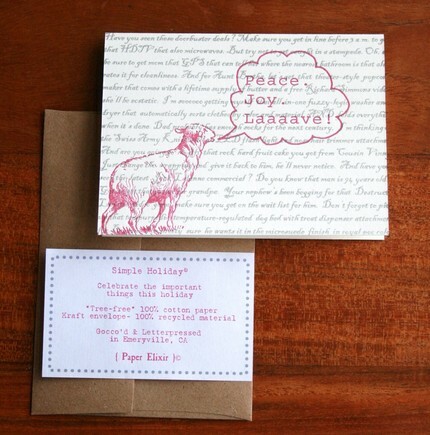 As I perused through the holiday cards on Etsy, I smiled and maybe even chuckled a little when I saw this letterpress print by Paper Elixer. I laaaave it! $4.00. 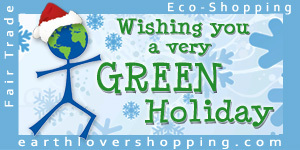 Be sure to check out all of the great holiday deals at Earth Lover! 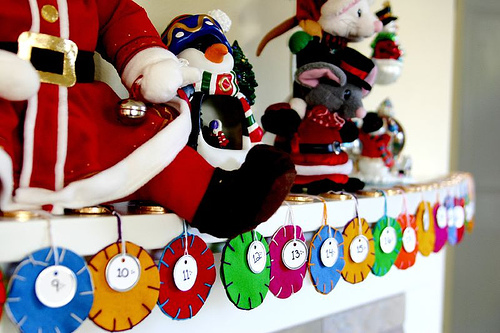 I can remember opening the little paper windows on an advent calendar every December when I was younger. Sometimes I would sneak a peek a few days ahead and steal the chocolate goody that was waiting for me. I want to start the same tradition with my little Ava and I found some great ideas to inspire me. Pretty soon I will be counting down to everything! This calendar is so cute and colorful! Felt circles and little numbered coins to pull off as the days pass by. For more info on how to make your own, visit She Knits Shiznits. This Christmas Countdown Kit, put together by a mother and two daughter team called Sweetwater contains everything you’ll need [fabric, thread, rope, iron-ons, pattern] to create these delightful pouches you can fill with treats of any sort. $23.95. 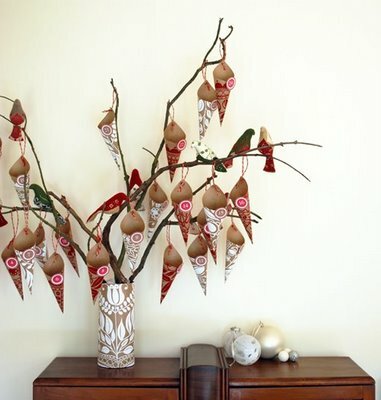 There is a great tutorial for this pretty advent tree on The Red Thread [by Lisa in Sydney, Australia]. It’s such a simple idea and blends beautifully into the decor of any home. This one is my favorite. These little beauties were made by Ashley of Nouveau Designs in my former home city of Brooklyn. 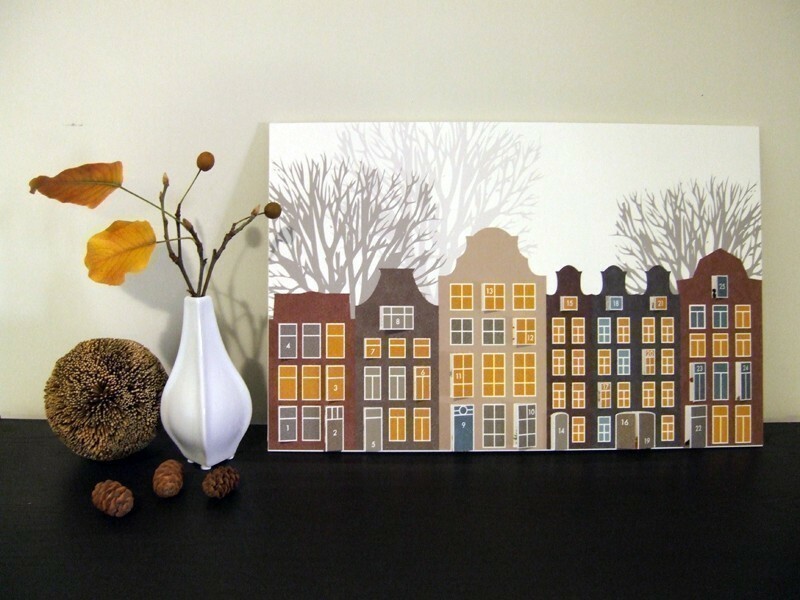 Inspired by the cityscapes of Brooklyn and Amsterdam … get one of your very own for $20.00. 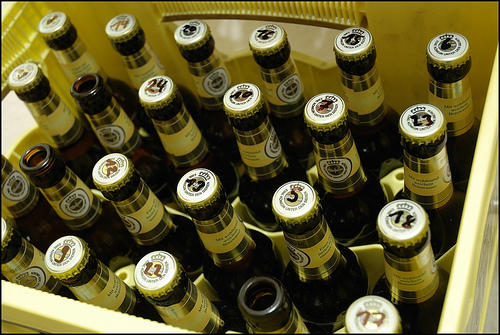 And just for fun I thought I would include this photo I found on Flikr of a Beer Bottle Advent Calendar … just be sure you don’t drink yourself to Christmas all in one night!